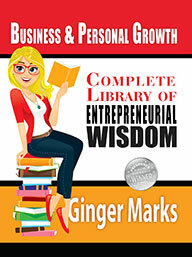 Local author and publisher, Ginger Marks, partners with Clearwater’s PNC Bank to provide insight and advice for prospective, new, and experienced business owners. Ginger will be available to chat and sign copies of her award winning book, Complete Library of Entrepreneurial Wisdom, and PNC Financial experts will be on hand to field your questions and educate you on business financial matters. Mrs Marks has spent 30+ years in the Tampa Bay area honing her skill as an entrepreneur. Having owned and operated multiple businesses, including a restaurant and a multimillion dollar surgical clinic, she knows her way around business and how to operate one successfully. Event date and location: October 9, 2014 between 5:30 and 6:30 pm at 2498 Gulf-to-Bay Blvd. Books available at your local bookstore and at this event.